The Strangest Beauty Product – amandarobots. When I received the imPRESS Manicure VoxBox in the mail, I was reeeally unsure of the concept. Press-on nails are a trend I remember from my childhood and they weren’t great then. But who knows, right? This is 2014, maybe the concept has been improved upon! When I opened the box, I wasn’t all that imPRESSED (see what I did there?). The colour that was sent to me was a bright, neon orange that I’d deem more appropriate for my toes; the design that was sent to me was arguably worse. French mani. Zebra. Hot pink. Glitter. There’s just a lot going on. But still, I thought I’d give it a chance. My nails needed doing, so why not press them on? The set comes with 24 nails with 12 different nail shapes. It was fun to find the shapes to fit my nails – it was like a puzzle. But it was all downhill from there, folks. The adhesive backing is SUPER sticky. When I put it on my nails, it felt like…well, like I had something rigid and uncomfortable on my nails. The nails themselves were super long; I don’t keep my natural nails long, so that made these doubly uncomfortable. Another thing is that the free edge of some of the nails was jagged. I wouldn’t want to wash my hair or apply skincare with these on, and yet, the packaging says that they last for up to a week. I couldn’t bear a week with these guys on, folks. 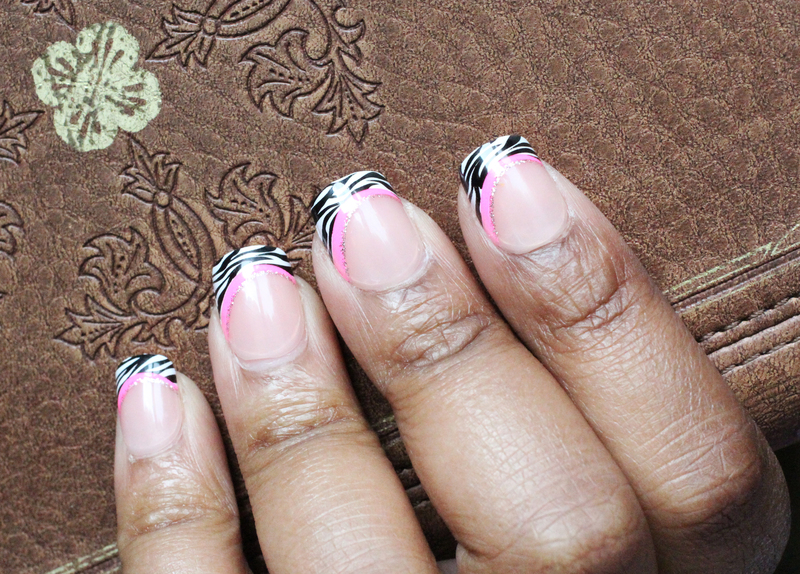 I couldn’t even bear to leave the house with long, zebra-glitter-hot-pink-french-tip nails. They just seem a bit tacky to me. I removed them promptly after taking these photos. The final verdict? This might be fun if you’re a young teen at a slumber party or going to the school dance. It might be useful if you have a hard time growing your nails and are looking for a cheap alternative to gel or acrylics. But for someone like me – with fairly hard nails that I purposely keep short and polished with mostly understated colours – the imPRESS mani isn’t gonna fly. I received these products complimentary from Influenster for testing purposes!